The Way a Pure Chamomile Tea Should Taste Like! Summary : Not your average supermarket chamomile tea, that's for sure. This is a light tasting, refreshing and non-stinking chamomile tea that is perfect right before bedtime. Review : So, here it is again. I'm still up at 2:30am, and what am I doing, well, trying to get to sleep. But, as all too frequently happens, I can't. So, what's the solution? Chamomile Tea, of course! This tea is the one sure-fire thing that, without fail, tends to put me to sleep very, very quickly. So, I dug through my ever-expanding assortment of teas and found a overlooked Chamomile Tea from Culinary Teas. A person can not help but be impressed with this tea for one simple reason - the flowers in this tea are MASSIVE. It's almost like someone had just gone out the day before and picked the chamomile flowers right off the plant. This chamomile tea from Culinary Teas contains exactly one ingredient : Chamomile Flowers. As such, this tea has nothing else added into it. It is, quite simply, pure chamomile. And as mentioned above, the flowers in this tea are "texas sized", and expand even more during the brewing process. Now, I've tried several "pure" chamomile teas from various supermarket brands and have come away unimpressed. On the other hand, I have found a couple of tasty chamomile teas I liked (such as Tazo's Calm Tea), that have been infused with spearmint or other things . Because of this, I really didn't know whether or not I would like this tea, having struck out with "pure chamomile teas" prior to this. Thankfully, I need not have worried. Quite simply, there is absolutely, positively no comparison between this chamomile tea from Culinary Teas and the other "pure chamomile teas" you pick up out of the supermarket. There is simply a night and day difference between them, with this tea winning hands down - easily. The taste of this chamomile tea is very light, as it should be for a bedtime tea. But yet, the taste is refreshing. And, better yet, the light-taste still tastes good. It's a far cry from that "burnt" taste I've had in some other chamomile teas. So, if you are looking for a "pure" chamomile tea for relaxation purposes or to take before bedtime, well, look no further - as this tea is all you need. And oh, as a sidenote, within 10 minutes after taking my first sip of this tea, I felt the chamomile really kick in. Being a loose leaf tea, I thought this might happen - it's more potent than the supermarket brands. As such, I'm now about to pass out in front of my computer so it's time to call it a night. Sweet Dreams. Recommendation : Yes. Keep in mind chamomile teas are very light tasting. And this one was no exception. Yet, it was a pleasantly light tasting tea. And the tea had very little after-taste, making it a perfect bed-time tea. 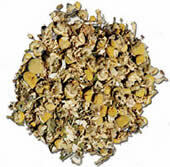 For lovers of "pure chamomile tea," which has nothing added into it, this tea is simply ideal. Brewing Instructions : Pour 6-7 ounces of boiling water over tea pieces (tea consists of pieces of whole flowers). Let steep for 5-7 minutes. You'll need two teaspoons of tea pieces for a cup, due to the large, chunky size of the pieces in this tea.